Invalid Username/Password combination. Try again. *Password must be a minimum of 7 characters & include at least 1 number. Officer Name Cell Number D.O.B. State or federal issued form of identification. Given out by the Department of Motor Vehicles. This license states what type of dealer you are; Used Car, Motorcycle, Trailer, Marine. Normally given by the City in which the business is located. Not all US cities give out this license. Given by the Department of Revenue. This license is required to be tax exempt in the state. A company check can be blank or partially written, and the word “VOID” indicates that the check should not be accepted for payment. Insurance Policy that is required for the dealer to have a Dealer License in the state. A bond is given to protect the recipient against loss in case the terms of a contract are not fulfilled. It looks like you are already in our system! Someone from the Dealer Registration Department will contact you within 24 hours. If this is an urgent matter please call our customer service line at 888.292.5339. 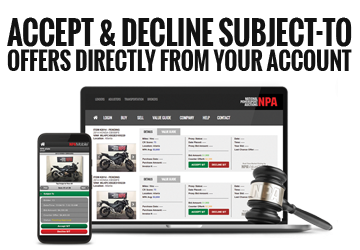 Thank you for your interest in National Powersport Auctions! We have received your registration request. Please click the link below to view and download documents we need completed prior to finalizing your registration. We will also send you an email with the information. Standard turn around time is 1 business day for most registrations.